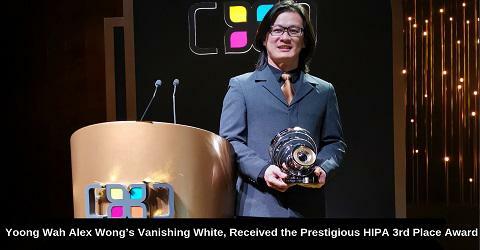 FASS/VAVCD Faculty member, Yoong Wah Alex Wong’s video and photography work Vanishing White, received the prestigious HIPA 3rd place award from His Excellency Zaki Anwar Nusseibeh, Minister of the State, Dubai at the international renowned photography award which is organised by the Hamdan Bin Mohammed Bin Rashid Al Maktoum International Photography Award (HIPA). Her Highness Sheikha Latifa bint Mohammed bin Rashid Al Maktoum, Vice Chairman of Dubai Culture and Arts Authority also attended the award gala held at Dubai Opera on 12th March, 2019. “Hope” is the theme and concept of 2018-2019, the eighth season international competition. This year there are 149 countries participants, with more than hundred thousand works participated. Each participant can only send one entry per category. This season’s surprise comes in the shape of an aerial challenge set out to photographers, which is the ‘Aerial Photography’ video category. This challenge opened the door for thrill-seeking lovers of aircraft photography and videography to produce unforgettable works that will no doubt transcend reality by imagination. Current work in progress and part of The Aesthetics of Climate Change - Vanishing White series, can be visited in FASS Art Gallery from 6 - 22 March, 2019. Vanishing White series depicted the arrested moments of epic encounters of the frozen landscape, Lake Baikal. This video intend to investigate the exceptional formation and condition of the oldest and deepest existing fresh water lake on earth during the coldest period in winter (around minus twenty to forty Celsius). It is believed to hold one fifth of the world’s fresh water. From far away distance, the white splashes seems like sea waves. However the entire lake surfaces freezes in winter, leaving the surrounding village a lifeless wonderland. In this search, the cracks, textures and broken pieces of ice forms the perfect intricate canvas. The frozen layers are moving, breaking, thawing, retreating and daunting, just as the frozen lake is solid on the surface, yet fragile when the water currents flows underneath it. Human activities slow down when the temperature drops. The chilling, unfriendliness and extreme weather condition keeps people away, and I find it harsh and hostile yet strangely beautiful. It endures my presence, but it is rarely welcoming. I believe in and aspire to bring a new perspective of photographing and videographing landscape we already know well, an epic cinematic and composition that is not possible before. With the frosting snow and ice blanket, the deep silence sounds like eternity. As such, these marvelous yet temporary ice layers vanishes when the temperature rises.